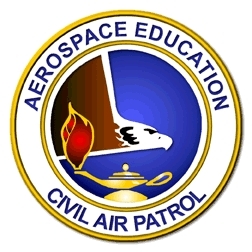 Civil Air Patrol (CAP) promotes and supports aerospace education, both for its own members and the general public. CAP educational programs help prepare American citizens to meet the challenges of a sophisticated aerospace society and understand its related issues. CAP offers national standards-based educational products, including a secondary textbook, Aerospace: The Journey of Flight, and the middle-school-level Aerospace Dimensions. Teachers can get free classroom materials and lesson plans from CAP by joining CAP’s Aerospace Education Membership program. Click here for information about Cadet Programs. Recipient of the Air Force Association’s Vandenberg Award, theNational Aeronautics Association’s Brewer Trophy, and the Space Foundation’s Education Achievement Award.